Science fiction for kids is rare enough; truly funny middle-grade science fiction is even rarer. In fact, off the top of my head I can only think of one book in the hilarious middle-grade science fiction genre: The True Meaning of Smekday. 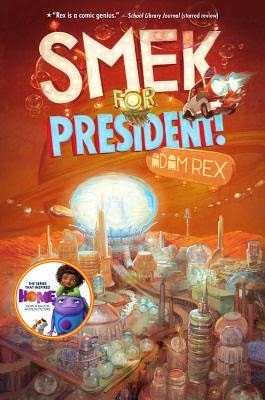 Now that number has doubled, with the publication of a worthy sequel, Smek for President. If you haven't read The True Meaning of Smekday, why not? Go forth and read it now! It's a great road-trip buddy comedy about a girl and an alien on the run from the evil alien overlords. Beyond this point there will be spoilers for the first book. In Smek for President, human leader Dan Landry has taken credit for defeating the Gorg. No one, human or Boov, knows that it was really Tip and J.Lo who discovered the Gorg's weakness and defeated them with hundreds of cloned cats. Tip is living an anonymous life trying to adjust to being a regular girl again. J.Lo is infamous on two worlds: he can't seem to stay out of trouble in their community on Earth, and to the Boov he's still the Squealer, who accidentally signaled the Gorg in the first place. Tip and J.Lo decide to take a trip to New Boovworld (formerly known as the moon Titan) to explain to Captain Smek what really happened and clear J.Lo's name. Hilarious hijinks ensue, including a low-gravity chase that is every bit as awesome as you'd hope for a low-gravity chase to be, an escape into a garbage-pit, (with obligatory Star Wars reference) and a lonely bubble-billboard. There's more awesomeness that I can't say anything about without spoiling the book. There are several comic sections that extend the story throughout the book. There's not much else I can say, except that this is a perfect middle-grade book, and fans of The True Meaning of Smekday will love it. Anyone who hasn't read The True Meaning of Smekday would be well served to read it first. The protagonist Tip is mixed-race. She's also an awesome character that boys and girls of all races can identify with. (How many times am I allowed to say awesome in one review?) Here's a great post that discusses race, culture, colonialism, and diversity in the first book. The second book doesn't get into these issues so much, although it does take some pretty funny stabs at politics.